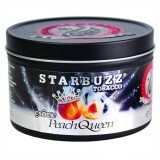 Starbuzz BOLD Peach Queen | HookahRev.com | Hookah, Simplified. Smells Like:: Peach with clove and possibly another spice. Nice addition to the BOLD line. Good use of spice to make it a unique take on peach flavor. The combo is odd at times. Not a daily smoker for sure.